Jake Zien may be young, but he’s creative beyond his years. He’s the proud inventor of Pivot Power and its app-enabled successor, Pivot Power Genius: flexible surge protectors that solve the problem of overloaded outlets. After learning about his early success in the invention world, we thought Jake could help with the daunting holiday task of finding gifts that will surprise and impress the people on your list who already seem to have every cool product and device known to man. Those guys are no match for Quirky’s gift-producing prowess. Remember those science fairs from your high school days? You probably came up with an idea that seemed revolutionary at first, but ended up proving impossible to execute. But there was always one kid who managed to invent something both cool and useful. Jake was that kid, and the Pivot Power was his concept. His final project at the pre-college design education summer program at RISD — the college he went on to attend as an industrial design major — was to come up with, develop, and present a product, and this assignment inspired his idea for the Pivot Power. Jake knew he had a great concept, but “the government fee for a patent to truly protect this idea was at least $10,000, and beyond that, I considered the process of attempting to produce the product alone extremely daunting.” That’s where Quirky came in, serving as the perfect business partner to guide Jake through the process of protecting and manufacturing his device. So what does Jake think about the final product? “From what I can tell, it really is the best power strip available, and I say this with a true and complete disregard for my royalties from its sale. Not only does it solve a real problem, it does so in an elegant, even delightful way.” But Jake didn't stop after he'd solved one problem. The Pivot Power Genius, the app-enabled version of the Pivot Power, eliminates the nagging stress of wondering whether you turned off a lamp or unplugged the hairdryer. It connects two outlets to your mobile device via the Wink app, allowing you to control them remotely, and stop worrying about leaking electricity. The Pivot Power isn’t the only elegant and delightful problem-solving gadget to come out of Quirky’s collaborative community. Jake compiled the following list of his favorite giftable Quirky inventions to help you prevail in the holiday shopping arena. Ready to start checking people off your holiday shopping list (and maybe pick out a few personal presents for yourself)? 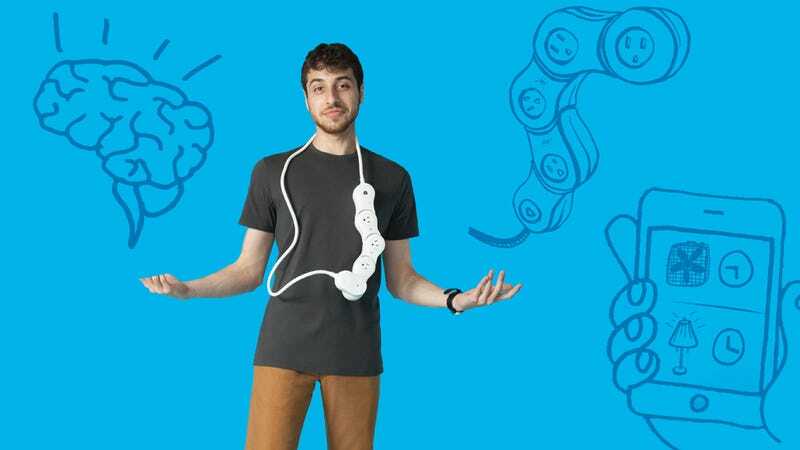 Head here to check out these and other inventions that have come out of the Quirky community. This post is a sponsored collaboration between Quirky and Studio@Gawker.